Let's face it, being Free 2 Play (F2P) or even semi F2P (I do spend the odd dollar or five now and then) in Lords Mobile can be extremely challenging when everyday you are faced with countless Pay 2 Play (P2P) players ready to take advantage. I have been playing this game for almost a year and from the beginning, I realised the importance of having a strong line up of Colosseum (Colo) heroes. While, mostly everyone else in my guild was trying to gold their Trickster and Scarlet, I was plodding away at ranking and colouring my Prima Donna and Shroud. I mean, yes, the research and construction boosts from Trickster and Scarlet are awesome, but I'm a patient gal. I didn't need to get things done as quickly as possible. It would be nice, sure, but the thing we need the most in this game is gems. Colo could get me gems. Even before I unlocked Treasure Trove, Colo would be my biggest souce of free gems over monster hunting. For about eight months, I plodded along, waiting patiently on my STA to build and then use to get my Prima promoted and upgraded. By the time the game brought out the Familiar System, I had a gold Prima and Shroud. And then I was told about Aquiris. What? There's a Familiar that gives you extra STA? How does this Familiar thing work? Somebody explain it to me! What do I do with Runes and Fragments? Do they not do the same thing? How are they different? Pacts? Huh? Eventually, I was properly enlightened about it all and it was like a brilliant light shining in the slow-building STA darnkess. Unlock Aquiris. Use fragments to level up his Refreshed support skill, but use Runes to upgrade him to adult and elder. Never use Runes for support skills because they are harder to get and you need a bunch to adult and elder your Familiar. Extra Runes can be turned into Fragments, but you only do this after you elder your Familiar. The higher your Player Level, the higher your Familiar Level. 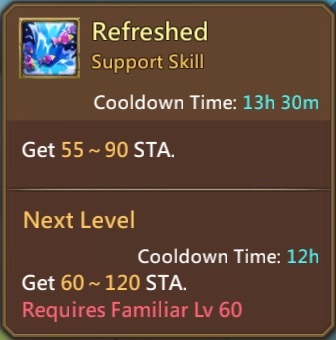 I tell you, there is no better reason to get to Player Level 60 than Aquiris' Level 10 Refreshed Support Skill! You will get between 60 to 120 STA every 12 hours. I'm at Refreshed 9 right now and boy, do I take that seriously. I set a timer for that 13 hours and 30 minutes and nothing stops me from collecting that STA. I wake like a zombie in the middle of the night when my timer goes off to collect my precious STA and use it. I excuse myself from meetings and conversations to click on that "Use" button. I think I might need psychiatric help…Ha ha! 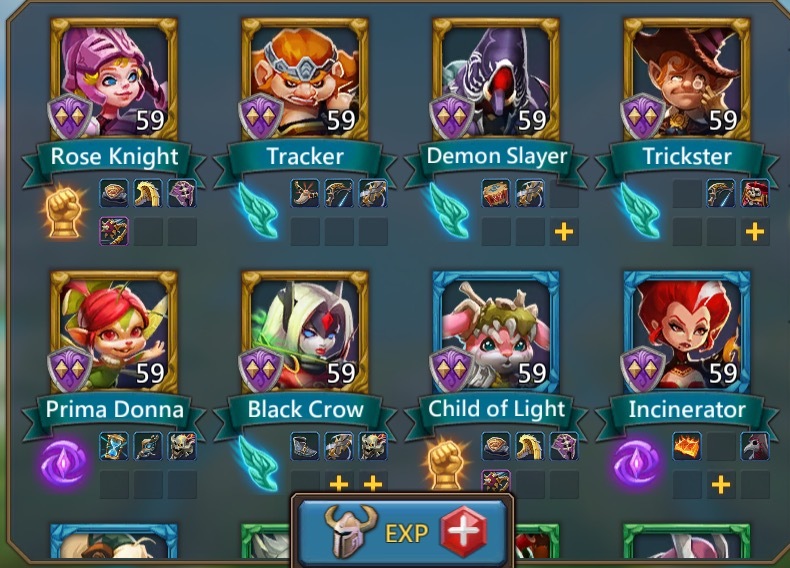 So I've just golded my sixth hero – Trickster. Scarlet is next. I'm finally working on those research and construction speed boosts! My Level 59 Colo team is doing pretty well in the 700-900 range against mostly Level 60 players and collecting a little over 500 gems a day. 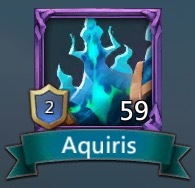 And I owe it all to Aquiris, the Lords Mobile love of my life. Granted Guard.2000 is not too far behind him in my adoration, but Aquiris is the reason I have an all gold, rank 8 Colo team just a couple months after the Familiar system was introduced. If there is any Familiar you work on, let it be him. There are some other great ones which I will eventually write about, but for hero progress, you can't go wrong with my boy, Aquiris. Go on, use him. Let him give you a fighting chance over those P2P players in Colo and if you are P2P, well what the heck is wrong with extra STA? Nothing, that's what. Happy gaming folks!